Spring wheat has a higher protein content than other varieties grown in the United States. This corresponds to a higher level of gluten, which means the flour from this wheat has the best dough-handling characteristics. Additionally, spring wheat flour has exceptional water absorption, which increases the moistness and softness of the finished products, resulting in a longer shelf life. These characteristics set spring wheat apart from other classes and make it the flour of choice for the crafting of high-quality bread and pastries. Spring wheat flour is often mixed with lower protein wheat flours to improve the quality of the resulting batch of flour, as well. 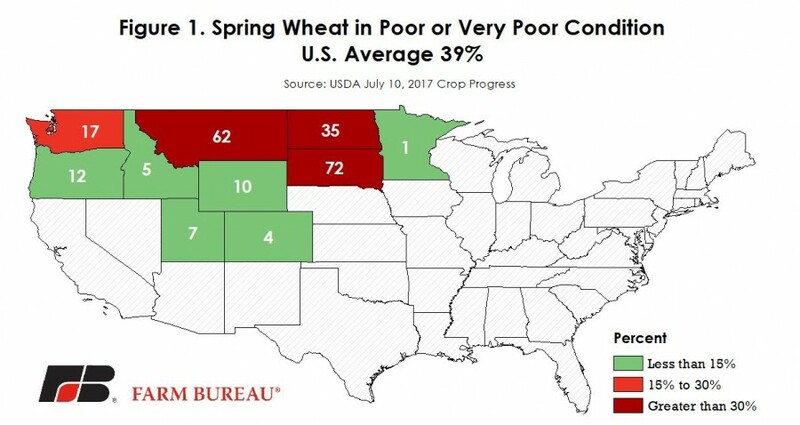 Due to the ongoing and worsening droughts in Montana, North Dakota and South Dakota, USDA’s July 10, 2017, Crop Progress report indicated that 39 percent of this year’s U.S. spring wheat crop, representing 4.3 million acres, is presently in poor or very poor condition. North Dakota, the largest spring wheat producer, has 35 percent of its 5.3 million acres planted in poor or very poor condition. Figure 1 highlights the percent of acreage in poor or very poor condition. The drought occurring in these areas is significant. 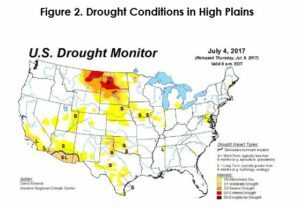 The United States Drought Monitor currently has categorized over 46 percent of the High Plains region to be experiencing drought conditions with 16 percent of that categorized as either in severe or extreme drought. To be placed in the severe and extreme categories, an area must be experiencing characteristics of prevalent crop and pasture losses and widespread shortages of water. Figure 2 geographically displays these exceptionally dry areas of the nation. This drought is having widespread effects throughout the region. Actions are starting to be taken to combat the negative impacts that often come with drought conditions. For example, USDA continues to modify emergency haying rules as they pertain to the Conservation Reserve Program lands in Montana, North Dakota and South Dakota so that producers of livestock have more forage available to sustain their herds through these tough growing conditions. This authorization will remain in effect until August 30, 2017. 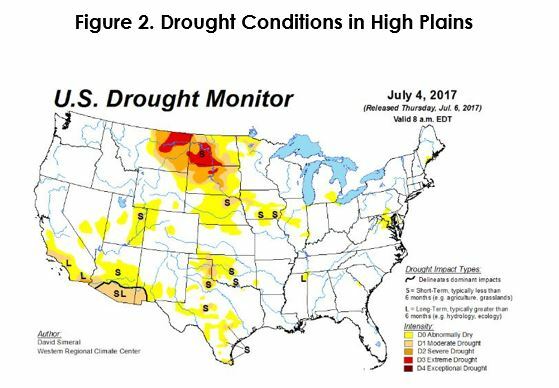 A recent Market Intel article, Northern Plain Drought Accelerates, Placements Head South, highlighted the impact of the High Plains drought on cattle placements. USDA’s July 12, 2017, Crop Production report estimated spring wheat harvested area at 10.5 million acres, down 7 percent from 2016 and the lowest harvested area since 1972. If realized, this would represent an acreage abandonment rate of 3.7 percent – higher than in recent years but potentially below market expectations given recent drought conditions. 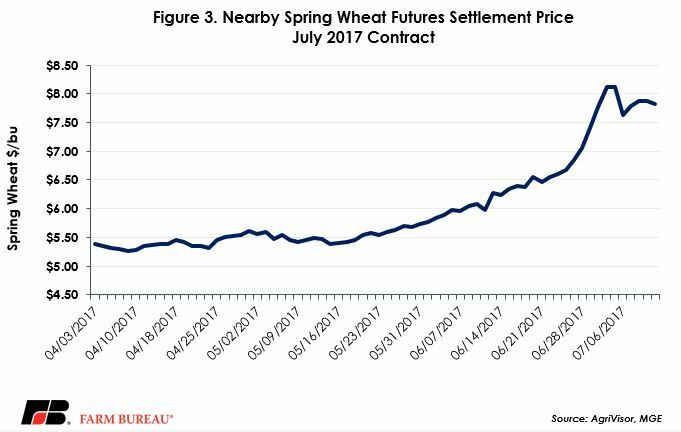 Continued dry conditions and expectations for reduced acreage drove up settlement prices of spring wheat futures contracts substantially over the past few weeks. Spring wheat futures are offered on the Minneapolis Grain Exchange. Figure 3 shows the increase from a mid-May price of $5.50 per bushel to nearly $8 per bushel in early July. 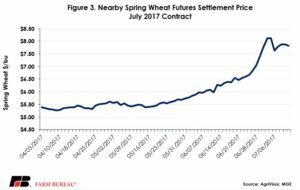 This 45-percent increase is a result of growing season supply concerns for new crop spring wheat. The July 12, 2017, World Agriculture Supply and Demand Estimates (WASDE) projected 2017/18 spring wheat production to be 385 million bushels, a decrease of 22 percent compared to last year’s production. Total use for 2017/18 is projected at 561 million bushels, down 11 million bushels from the 2016/17 marketing year. Lower spring wheat production, driven by lower yields and harvested area, combined with a modest decrease in consumption would result in ending stocks of 122 million bushels, nearly half of last year’s 235 million bushels. With growers having fewer bushels to harvest and take to market this year, they can expect higher prices per bushel to make up for the potential production losses they may experience due to the unfavorable growing conditions. Uncertainty remains in spring wheat. Prices could potentially fall from these lofty levels if growing conditions improve in the coming weeks, acreage abandonment is lower than anticipated or crop yields are higher than anticipated.